Avon is Mother Earth-friendly.... They are discouraging the use of plastic bags among the franchise dealers. That's why I use spacious black and green eco bag whenever I have to purchase items especially the large ones, like the Barbie Lunch Box and Tumbler Set ordered by my officemate for her daughter. I have lots of eco bags at home. I use them during grocery shopping and even during "Divisoria" days. 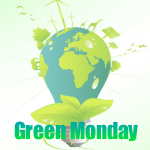 Click the logo below to join us on Green Living Monday. haven't browsed an avon catalog lately.. pero ang ganda ha.... ma check nga.. ;) was here for green monday. That is one nice eco-bag! Ako rin, I have lots of eco shopping bag, kaso madalas ko rin makalimutan, lol! oi! abg ganda nga ng eco-bag..
Hope you can come and visit my GMs: Missy Yellow, Celebrating 6th Month, May 15, 2011 and Multi-color Bracelet. Thanks! Daming magagandang tote bags ngayon sa green monday a. Nice one sis. Hope to see you in my G Monday post here. I hope you can visit My Indoor Green entry. See yah! Hmm, it's been a while since i visit Avon too. Maybe i should visit it again and have a giveaway for all my green living friends. thanks for joining.